Recently, a friend and I went to the David Hockney exhibition ‘Current’ in Melbourne. Known as the UK’s greatest living artist, Hockney, who turns 80 this year, is a master at embracing the new while still acknowledging the past. His digital art is inspirational, but so are his acrylic portraits. One informs the other, it seems. Anyway, my friend and I were talking about how we felt overwhelmed by the current political situation at home and abroad, poor treatment of asylum seekers and refugees in many countries, erosion of women’s rights and the disintegration of fair work practices. Although we believe in fighting against these things, it is also worth noting that you can’t fight all the time. It is still important to take time out to create: paint, write, cook, or whatever your idea of creativity is. To this end, here is my latest attempt at creativity: a painting done with Copic markers and fine-line pens, inspired by a photo of an old building I saw when I visited relatives in Oamaru, New Zealand. 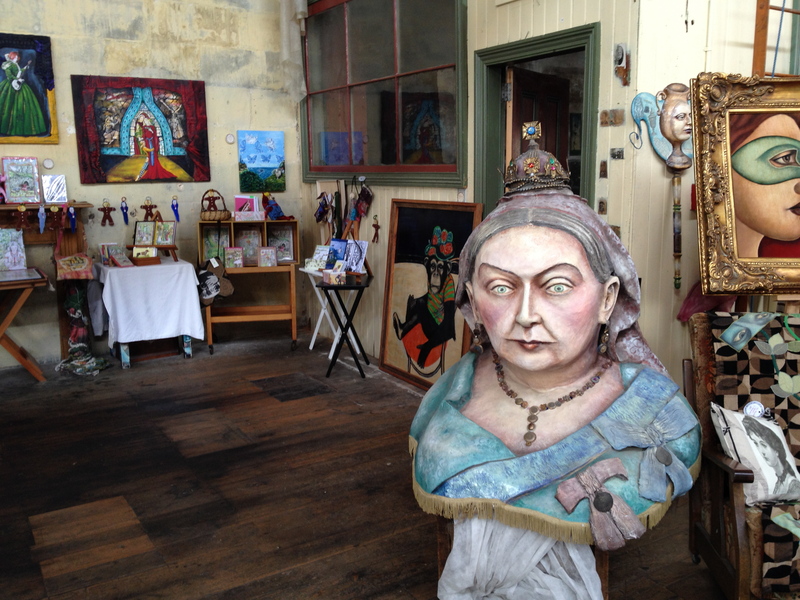 Oamaru is a peaceful South Island coastal town of grand historical buildings and a centre of ‘steampunk’ culture. Unlike the perfectly renovated buildings in the nearby tourist precinct, this one was yet to be ‘done’. I kind-of like it this way, though. The Steampunk Capital of the World: who would have thought? 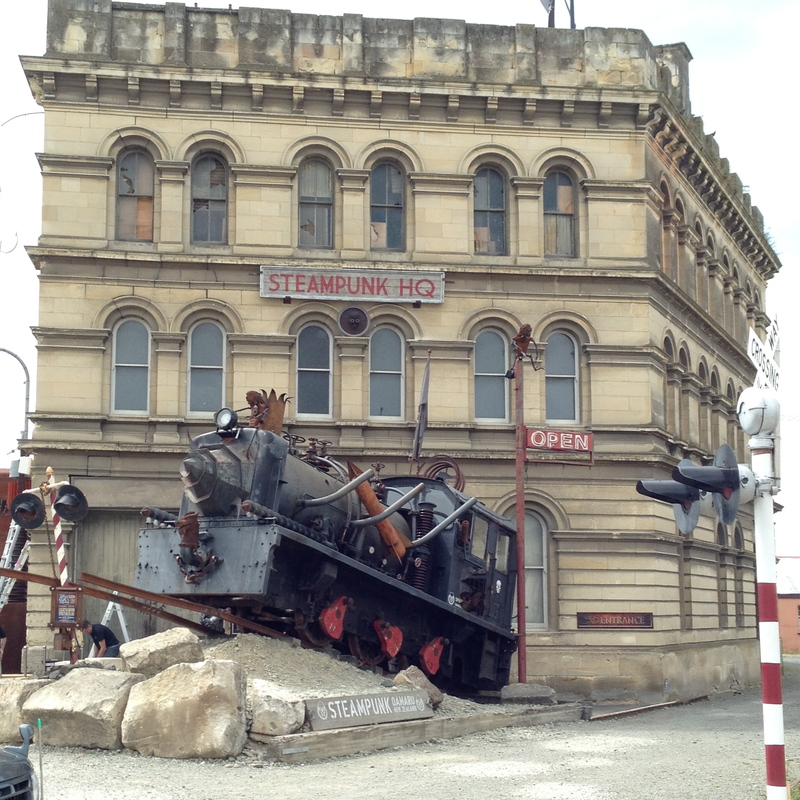 Steampunk HQ in Oamaru’s Victorian precinct. There was a surprise waiting for me on my recent trip to Oamaru, a coastal town of 13,350 people in North Otago on New Zealand’s South Island. I’d known before going that it had a “Victorian precinct”, an old part of the town down by the docks that had been restored as a tourist area to show off its handsome 19th century buildings. What I didn’t know is it had also become steampunk territory: in fact, it is the declared “steam punk capital of the world”. What is steampunk? It’s basically an art and aesthetic movement inspired by the industrial revolution and Victorian times, with an added science fiction element: think Jules Verne and H. G Wells originally, and more recently, Phillip Pullman. There are also films, TV shows, plays and music that are considered “steampunk”, including, for example, Rock ‘N’ Roll Train by the Australian band AC/DC and—wait for it—Justin Bieber’s version of Santa Claus is Coming to Town, as seen in the 2011 film Arthur Christmas. This was a brilliant marketing idea for Oamaru, and people come from all over the world to see the precinct. I went to Oamaru this month during a week spent in Dunedin (where I was born but spent only the first three weeks of my life). There is an annual Steampunk NZ Festival here too, the next from May 30 to June 2, complete with an “absinthe night” and penny-farthing lessons. Tickets are pretty reasonably priced—$200 for an adult passport to everything, including food, for example. Read more on this here. 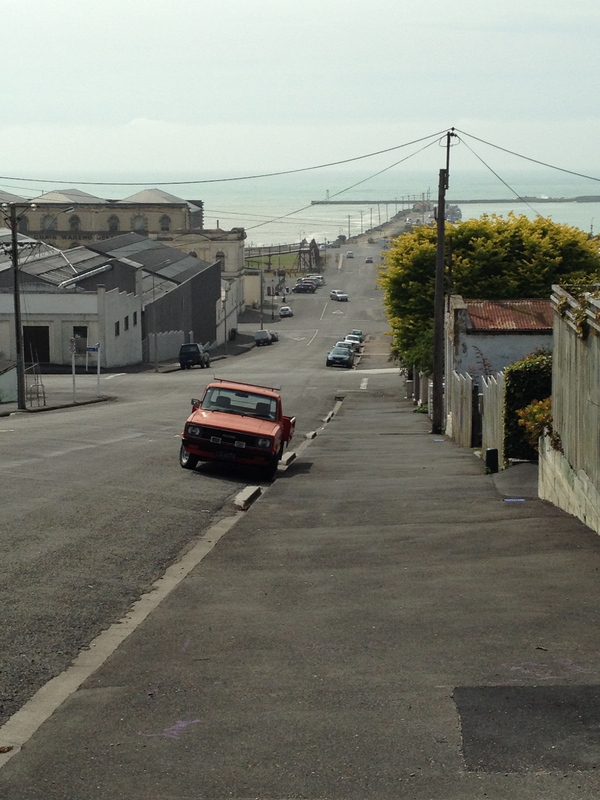 Approaching Oamaru’s Victorian precinct (starting with the last building on the left) from Wansbeck St. The precinct is very busy on weekends, but I visited on a weekday, when it was quiet and when the shopkeepers had time to chat to each other and me. Steampunk here seems to be, for many, a way of life rather than just a style. 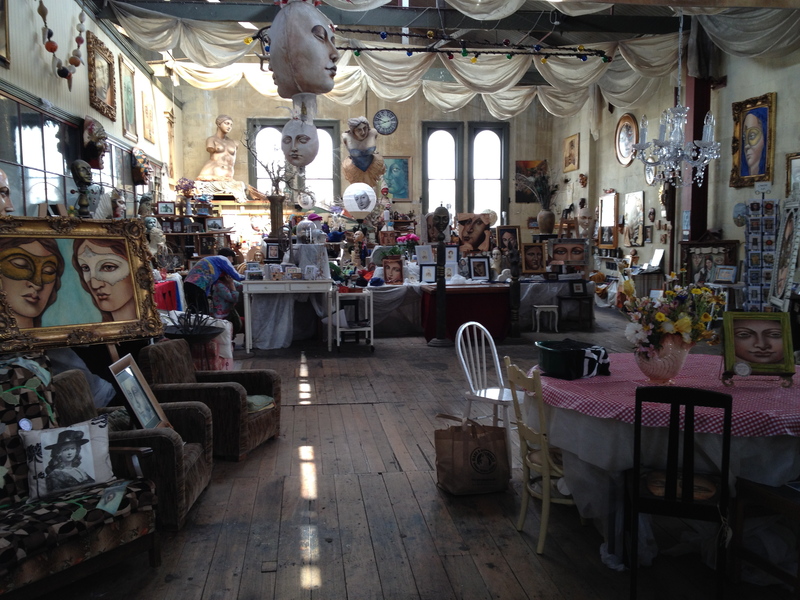 Donna Demente’s Grainstore Gallery, Oamaru. 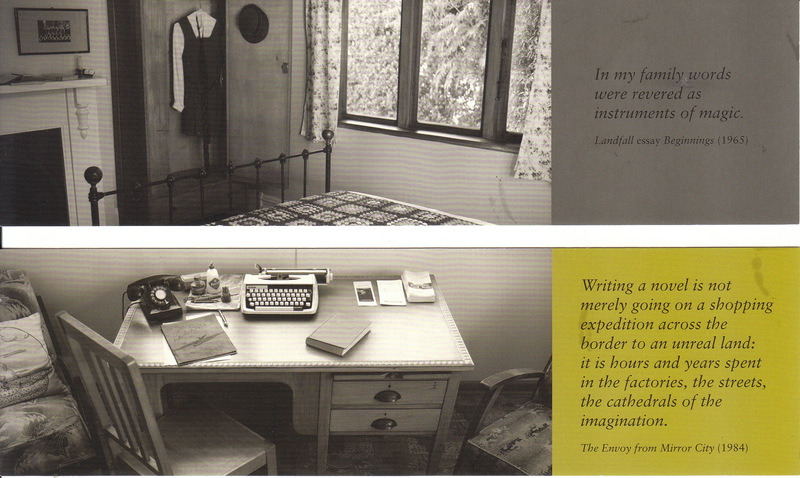 What is it that is so fascinating about seeing inside a renowned writer’s house, touching the desk they used to work at, seeing where they were brought up—pondering on what made such a brilliant mind? Do we writers hope that, somehow, aspects of the inspiration, the writerly brilliance, of the famous one will transfer itself to us? 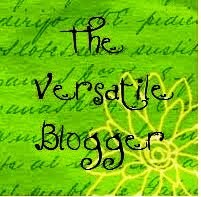 It seems that all writers are fascinated with the writing habits of other writers, and I am no exception. I remember being riveted, for example, by the chapter in Stephen King’s excellent memoir On Writing in which he described the placement of his desk. I also have a wonderful coffee-table book, simply titled Writers’ Houses, by Francesca Premoli-Droulers and Erica Lennard (Seven Dials, 1999), which allows me to peak inside the homes of Hemingway, Twain, Woolf, Yeats and Sackville-West, among others. 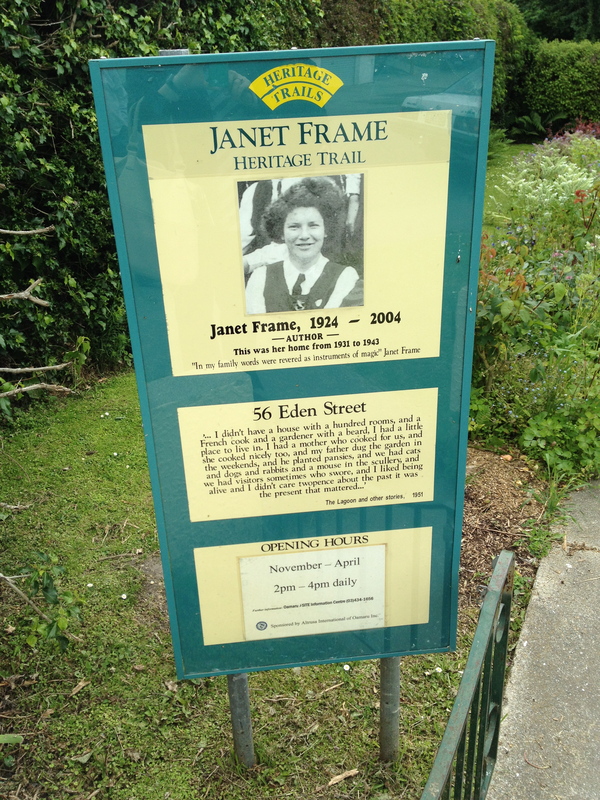 Today’s post is my own story of a trip to the home of one of New Zealand’s best loved writers, Janet Frame. On a week-long trip back to my birthplace in Dunedin, on New Zealand’s South Island this month, I caught a bus to the small seaside town of Oamaru. 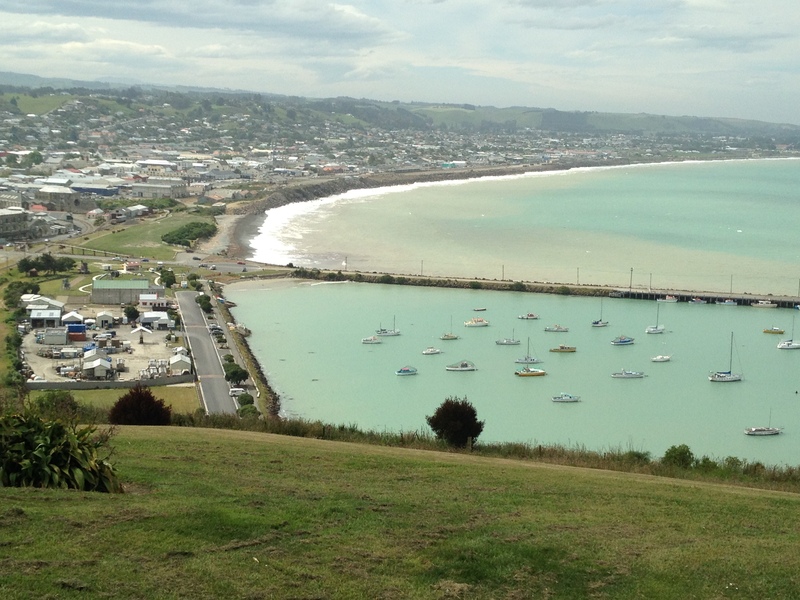 I wanted particularly to go to Oamaru, not only because I have family who have lived there for up to 80 years, but also to visit the town where the New Zealand writer Janet Frame spent her childhood, and about which she described in her autobiography as “the kingdom by the sea”. With my first cousins-once-removed, I had lunch at the oldest restaurant in Oamaru, the 100-year-old Star and Garter (9 Itchen Street), where I had the lightest, tastiest whitebait fritters, the thread-like fish caught locally only that morning. The Star and Garter has hosted many wedding receptions and anniversary parties from the early 20th century, and it has a fascinating wall on which are glued newspaper articles from these weddings. They are pasted at random, so one from 1927 might be next to one from 1972. There’s a great picture of that wall on Real NZ Festival Insider blog here. 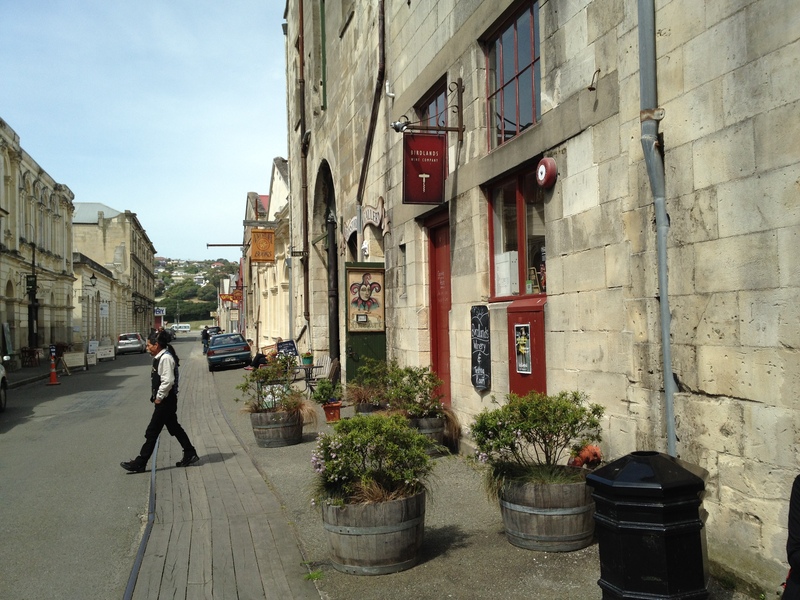 For more on the restaurant, see this blog: Oamaru Life. My cousins then took me to the childhood home of Frame, at 56 Eden Street, which she wrote about in several of her works. In typical New Zealand understatement, there is an unassuming plaque at the front, but you can easily miss it from the road and we drove by it at first without noticing it. 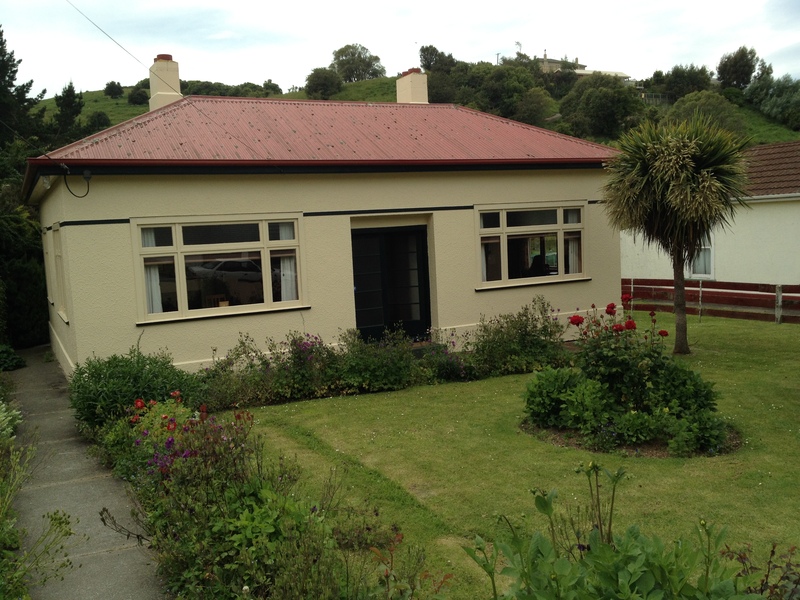 This is the house where Frame lived with her parents, three sisters and brother from 1931 to 1943. I was surprised—though I’m not sure why—to hear they hadn’t owned the house: it was a long-term rental property. They moved in when Frame was seven, and the four sisters shared a room and a double bed, as was common in those days, while their brother had his own room. The house is not large, particularly for a family of seven, but the rooms are generously proportioned, the ceilings high. “This is because it was built in pre-Second World War times,” the guide told us. There is no photography allowed inside, but these book marks show what it is like. The upper shows the girls’ bedroom, while the lower is Frame’s desk, which she donated to the house when it was being restored. The desk, of course, is from a later part of her life when she was living elsewhere. 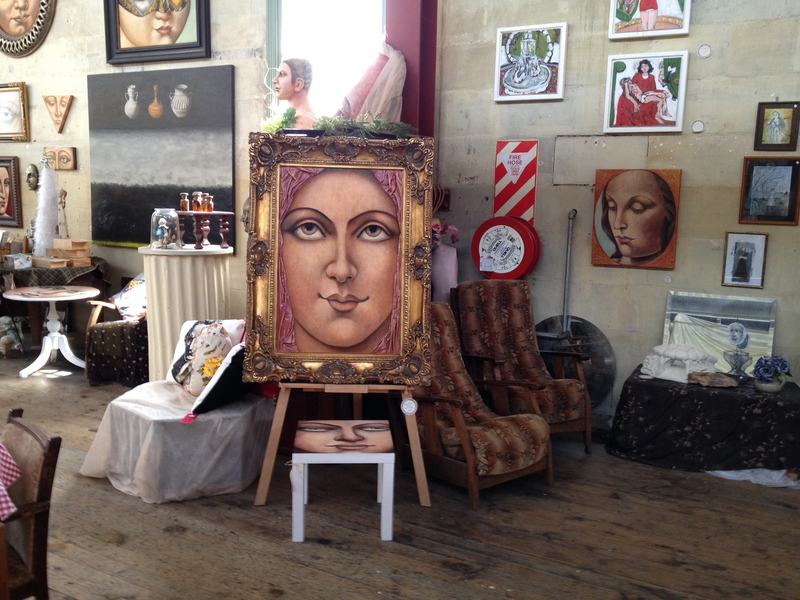 During the restoration, Frame herself visited the house and was asked if there was anything she would add to it. An old range would be a good addition to the kitchen, she said, and one was duly bought. In many ways, Frame had a tragic life, with two of her sisters dying young, and many years spent in psychiatric institutions having been misdiagnosed as schizophrenic and even scheduled for a pre-frontal lobotomy at one stage. As is the case with so many people with brilliant minds, they do not conform to the norms that society expects. I love this quotation from her childhood diary: “They think I’m going to be a schoolteacher but I’m going to be a poet.” You can read more about Frame’s life here. As might be expected in such a small town, my relatives knew the guide on duty that day. They didn’t know Frame herself, but my cousins knew or know several people connected with the family, and it was intriguing to hear them talking not of Frame as the great writer I know from books and films, but in terms of who was related to whom, and who went to school with whom and where they might be now, who they had married and what they had studied at uni, and so on. A highlight of the house is the 1930s free-standing radio, set up to play a real tape of Frame actually reading from her writing about 56 Eden St. As she describes her mother standing in the dining room by the light of the window, you can gaze, eerily, at just the spot Frame is talking about. I’ve read some of Frame’s books, including Owls Do Cry, The Lagoon and Other Stories, and To The Is-Land. I’ve also read Michael King’s seminal biography Wrestling With the Angel: A Life of Janet Frame (Viking, 2000). Several new works by Frame have been published posthumously, too. including the latest, Between My Father and the King: New and Uncollected Stories (2012, also published as Gorse is Not People). She left her entire estate, including manuscripts and publishing rights to all her works, to the Janet Frame Literary Trust, which she formed in 1999. I was interested to read on the trust’s website that the literary part of her estate is managed by the legendary Wylie Agency of London and New York. Janet Frame’s literary estate also runs An Angel @ My Blog that has all the latest publishing information. On a personal note, seeing the house and feeling surrounded by quotations from Frame’s evocative writing has made me want to go back and read more. So, I add more titles to my ever-expanding summer reading list.